Formosan lily is a native of Taiwan. It was widely cultivated as a garden ornamental, particularly in the temperate regions of Australia. Unfortunately it has become a major environmental weed. 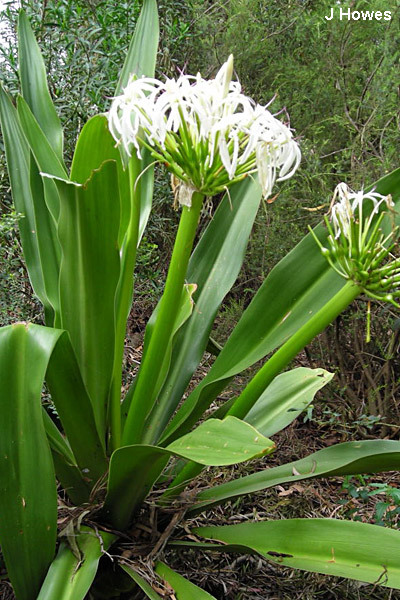 Formosan Lily grows along roadsides and in bushland, grasslands and disturbed sites. It spreads easily and can displace native vegetation. Formosan lily is an upright herbaceous plant with unbranched stems growing up to 2 m tall. Its elongated and narrow leaves are stalkless and hairless. It has very showy funnel-shaped flowers which have six large white 'petals'. These petals are usually flushed with mauve or reddish-purple on the outside. Its large capsules are cylindrical in shape. Dispersal: Seeds and bulbs are spread by water, wind, humans, contaminated soil and in dumped garden waste. Control of Formosan Lily is difficult. Hand dig the plant out, making sure all parts of the bulb are removed. Don’t just pull the plant up. The bulb is quite deep in the soil and all you’ll get is the stem with some roots (called stem roots). Treat before flowering. Bag all seeds (capsules). Follow-up treatment is required. Spraying with herbicide is generally ineffective. A closely related species is November lily (Lilium longiflorum). 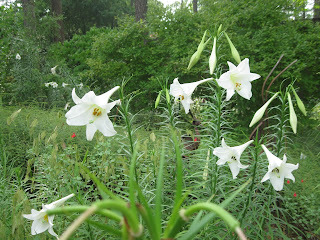 November lily has wider leaves and its flowers are pure white, with no sign of mauve/reddish-purple flush. Swamp lily - Crinum pedunculatum. This Australian native plant has rosettes of broad leaves and clusters of white, highly fragrant, flowers on 1m stems. Suits any soil, full sun or dappled shade and is mildly frost tolerant, it also grows well near ponds. 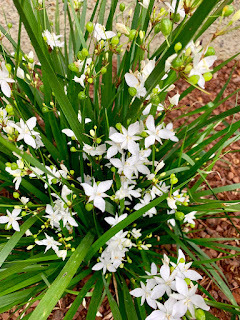 Grass flag - Libertia paniculata. Australian native which forms a grass like clump with masses of white flowers in spring, for moist, semi-shaded positions. Madonna lily - Lilium candidum. Unlike most liliums, this species keeps its green leaves through the winter. It grows, on average, to one metre with white flowers. Sponsored by GongOnline. Awesome Inc. theme. Powered by Blogger.